Canterbury’s Tristan Ovenden headed to Croft Circuit in North Yorkshire looking to secure the Supernational title for the 2017 season. The Kent driver headed into the season finale leading the category with an 8-point advantage over his nearest rival. With the championship being run over 9 rounds and including 2 dropped scores, everything was to be decided at Croft, especially as the final rounds result was excluded from the dropped scores so it had to count. 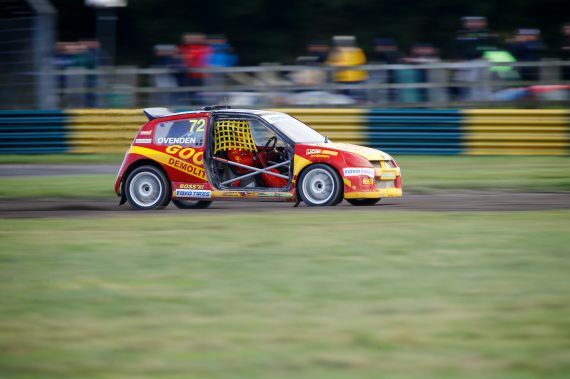 It was business as usual for Ovenden during the three qualifying rounds recording a second, first and third fastest time to sit in the top position at the intermediate classification stage. Despite losing the driver’s side door mid race during the second round of qualifying heats. The Goody Demolition backed driver made short work of his semi-final, despite the worsening weather conditions and claimed victory from pole position by a substantial 7 seconds enough to earn him the coveted pole position for the final. The final was to be held on the following day before the Grand Prix action got under way. Ovenden made, what is fast becoming a trade mark, lightning fast start and was the into the first corner ahead of the chasing pack. It was a sign of his driving maturity and skill that he decided against chasing and fighting for the event win and placing his championship hopes in jeopardy, instead he cleverly back off to ensure that he completed the race taking the flag in third spot and in turn the championship by a margin of over 10 points. Later the same day he drove his powerful Renault Clio V6 in the Grand Prix where amongst other things he managed to lose another door, this time the passenger one! He was to finish as the highest placed 2-wheel drive car. Speaking after the weekends racing, Ovenden said: “An unbelievable finish to a truly amazing season. We started the year in a new car and in a new category, the championship really wasn’t the aim. But it’s a testament to the hard work that the team around me does and the support from our sponsors, without either there is no way we could be as competitive as we are. I cannot thank them enough. This entry was posted	on Friday, October 27th, 2017 at 7:00 am	and is filed under Motor Racing. You can follow any responses to this entry through the RSS 2.0 feed. Both comments and pings are currently closed.